IOWA CITY, Iowa — Fifteen minutes into Brian Ferentz’s 30-minute interview session Saturday, three rings of Iowa reporters were still wrapped around the new offensive coordinator as he discussed his new role and Iowa’s offense. Nobody was more popular at Iowa’s media day than Brian Ferentz, and few people ever would describe him as reluctant to answer questions. His unfiltered approach often is the opposite of his father and boss, Iowa head coach Kirk Ferentz. Brian Ferentz has no problem poking at rivals, reflecting on the game or directly sparring with media. His frank assessments often sometimes come across as arrogant. But anyone who engages with Brian Ferentz understands his football intellect is as immense as his coaching potential. Yet as reporters continuously prodded into his thoughts and processes, Brian Ferentz was introspective. He admitted he’s out of his comfort zone after five years as offensive line coach. He acknowledged the task at hand is large and he needs more than his supreme football acumen to make Iowa’s offense decently balanced again. Brian Ferentz will lean on former offensive coordinators Ken O’Keefe (quarterbacks coach) and Tim Polasek (offensive line), as well as the head coach for playcalling and direction. This is no crown prince serving Kaiser Kirk. Brian Ferentz is a man who understands the responsibility that comes with calling plays in the Big Ten Conference. He’s spent the offseason asking questions of mentors and colleagues alike. He visualizes situations and respects the quick pace. He’s unsure if he wants to feel the game’s emotion on the sidelines or remove it in the booth. Former Colts playcaller Tom Moore told him he’d prepare to call NFL games by watching college football. Others have left him with more questions than answers. “I’ve given it a lot of thought,” he said. “Obviously, it’s a big part of my job. So I’d probably be mistaken to not think about it. Given it a lot of thought, but there’s a lot of situational things, there’s a lot of things that go into that. You’re certainly exposed to them, even when you’re not calling the plays. The biggest things for me is making sure I’m working ahead a little bit. As a play-caller, you’re more interested in the result, not what happened because you’ve got to work a call or two ahead the whole time. That’s going to be a little bit new to me. 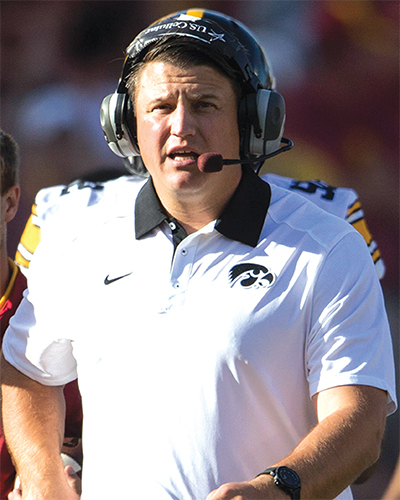 After starting at center and guard for Iowa from 2003 through 2005, Brian Ferentz began his coaching career at the grunt level in New England, performing 90-hour-a-week tasks on 30-hour-a-week paychecks. Eventually he moved up to tight ends coach in 2011, where he molded Rob Gronkowski and Aaron Hernandez into perhaps the best tandem in NFL history. “Brian Ferentz, my last year in New England, coached the tight ends and was the quality control guy on offense,” Houston Texans coach Bill O’Brien told Land of 10 in March. “He had Gronkowski and that group. And he was breaking film down on the side. That tells you everything you need to know about his work ethic. Then as Iowa’s offensive line coach, Brian Ferentz coached Brandon Scherff to the Outland Trophy in 2014 and the entire line to the Joe Moore Award in 2016. He served as run game coordinator in 2015 with a unit that rushed for 181.7 yards per game, the third-highest output in Kirk Ferentz’s career. Last fall, Iowa produced two 1,000-yard rushers for the first time in school history. Pro and college coaches have nibbled at Brian Ferentz for a while, and his move from offensive line to offensive coordinator was the right one for Iowa. He admits he was more efficient as an offensive line coach, which means he respects his position. But don’t mistake his reflection for insecurity. Nobody has more confidence than Brian Ferentz. No person at Iowa invites greater scrutiny than the offensive coordinator. At times the head football, men’s basketball and wrestling coaches see verbal arrows fired in their direction. Same with the athletic director, especially when primary sports fail to reach expectations. But second-guessing engulfs no position like the offensive coordinator. That was was true of O’Keefe from 1999 through 2011. That definitely was the case of Greg Davis from 2012 through January. That will happen with Brian Ferentz. Iowa will whiff on third down. Receivers will fail to separate and passes will fall incomplete. The Hawkeyes will run a predictable outside zone on third-and-3, fall a yard short and punt. There’s likely to be losses this year and games where the offense struggles to gain traction. Fans will blame both Ferentzes and talk about the game passing them by. Criticism will be concurrently justified and unfair. But this elevation wasn’t for Sept. 9 at Iowa State, Nov. 4 against Ohio State or even late December in a bowl game that Iowa really, really needs to win. Brian Ferentz’s promotion is for 2018, 2019, possibly 2024 and maybe even 2031. He’ll grow with the position and nobody else could combine the foundation of Iowa’s past success with a willingness to modernize. It won’t be perfect this fall, but it will be better by November. And history will prove elevating Brian Ferentz to offensive coordinator was the right move at the right time.